(APN) ATLANTA — At the June 02, 2014 Full Council Meeting of the City Council of Atlanta, a majority of Councilmembers approved legislation granting the Atlanta Development Authority (nicknamed “Invest Atlanta”) the option to put out a request for proposals (RFP) for the sale of Atlanta’s Boisfeuillet Jones Atlanta Civic Center. The vote was ten to four. Councilmembers Alex Wan (District 6), Felicia Moore (District 9), Michael Julian Bond (Post 1-at-large), and Andre Dickens (Post 2-at-large) voted against. Councilmembers Carla Smith (District 1), Kwanza Hall (District 2), Ivory Young (District 3), Cleta Winslow (District 4), Natalyn Archibong (District 5), Howard Shook (District 7), Yolanda Adrean (District 8), C.T. Martin (District 10), Keisha Lance Bottoms (District 11), and Joyce Sheperd (District 12) voted in favor. Mary Norwood (Post 2-at-large) was absent. The landmark building–for which thousands of working class homes were destroyed in the 1960s–was intended to provide a venue for entertainment and other civic functions, but it has been under-utilized and has been a drain on the city’s budget, according to proponents of the sale. The ADA will be in charge of collecting bids from developers. Councilman Alex Wan (District 6), as Chairman of the Finance/Executive Committee, began the Council debate on the legislation, which had been introduced by Kwanza Hall (District 2). “I’m not particularly comfortable yet with the mechanisms by which this transaction will be conducted. It will effectively take City Council completely out of the decision loop once we release it into the wild,” Wan said. Councilwoman Moore was highly critical of the measure. “I’m afraid if we just move on this without trying to have a discussion and asserting our responsibility and role as Councilmembers in it on the front end, on how we would like to see this take place, what we’re doing is instructing the Administration that… [the Council is] going to get out of the authority,” Moore said. “I mean, it’s fine to report back to me after you’ve done something or to report to me in the middle of something, but that doesn’t give me or us as policymakers any general authority over changing the direction, as much as we would like to think that. If that was the case, we would have more on the front end than on the middle or back end. And we don’t have that,” Moore said. “I understand that some people may be comfortable and may be ready to move forward but I am not going to be supportive of giving a blank check on a city asset without having some sort of a respectful conversation about the general direction and what the Council would like to see and how they would like that to happen,” Moore said. “I generally believe we need a Civic Center in Atlanta, whether it’s this present facility or not” Councilman Bond said. “If we’re going to get rid of this present facility, I think we ought to be talking about building a new one. I think having the option of a venue such as the Civic Center in Atlanta, even though there are other many privately owned theaters in the area, adds a balance to the market… I think there is something worldly and mature about a city that has its own civic center. If it’s not this one, before we get rid of this one I would like to see some plans on where the next one would be,” Bond said. “For me this situation isn’t a question of could we do it, but should we do it… If we are going to do away with this facility, the city needs to be underway drawing up plans for a new civic center… It is more than just a theater, it’s a multi-purpose facility that we have used for at least fifty years for various purposes. We should not be without a resource like that,” Bond agreed. Councilman Martin noted the variety of uses for the Civic Center, including summer camps, training spaces for certain city workers, and even the possibility of an evacuation site should a crisis occur in the city. “Once you give this up, you have very much limited your ability to manage and control your destiny as it relates to crisis in a city this size. The city needs something that it owns, it controls,” Martin said. Those that voted in favor ultimately felt that the revenue garnered from selling and developing the Civic Center area would outweigh the costs of losing it. Current proposals for the space are residential, retail, hotels, an APS high school, and/or offices or studio spaces for film projects. Anita Beaty of the Metro Atlanta Task Force for the Homeless tells Atlanta Progressive News that Emory University is purchasing a great deal of land between Peachtree Road and the Civic Center in the SoNo neighborhood, and believes that Emory may be one possible force behind the sale of the property. Councilwoman Adrean introduced an amendment to allow Councilmembers to view the RFP before it is released to the public. However, the amendment is essentially meaningless because the process will already be out of the Council’s hands, so the Council’s ability to view the documents will not empower the Council to revoke its delegation of authority to the ADA even if it disagrees with the RFP. The amendment passed with 11 yeas and 3 nays. Councilmembers Smith, Hall, Young, Winslow, Archibong, Shook, Adrean, Martin, Bottoms, Sheperd, and Dickens were in favor. Wan, Moore, and Bond voted nay. The Council also rejected a motion referring the project back to the Finance Executive Committee for an additional two weeks of review. Wan believed the two weeks would allow them to tighten the RFP and possibly hold community meetings on the Civic Center. However, the vote to refer back to the Committee did not pass, with nine members voting nay and five yea. Those that voted in favor were Wan, Moore, Martin, Bond, and Dickens. Smith, Hall, Young, Winslow, Archibong, Shook, Adrean, Bottoms, and Sheperd opposed. 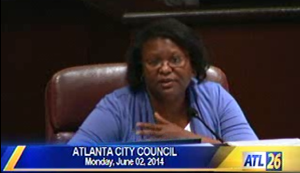 Archibong, who voted against a somewhat similar sale of City-owned property, the City Hall East debacle, in 2010, explained her vote in favor of the Civic Center sale to APN. “It’s my understanding in this transaction, it’s going to come to back to the Council before it’s officially dubbed the winner and that they’re going to incorporate comments. If we’re concerned about affordable housing, if we’re concerned about what is going [to replace Civic Center],” Archibong said. “It’s going to come back to us, and we’re going to have the opportunity to weigh… they’ll give us a presentation and we can say what we like or don’t like. It was said at the [Committee] Chair’s meeting, [by the Mayor’s Deputy Chief of Staff] Katrina Taylor Parks,” Archibong said. Archibong acknowledged, however, that this input and consultation will only be for informational purposes, and that the Council will have not have any real control over the RFP now that the Council has voted to relinquish control to the ADA. She said that this was an improvement over the City Hall East deal of 2010. When asked whether this presentation will be an open meeting, Archibong said she did not see why it wouldn’t be public. Much of the Council’s decision seems to have centered around legal advice provided by Peter Andrews, Deputy City Attorney, in his iconic smoky voice. Andrews said that under state law, the City is restricted to disposing of city property through sealed bid only, and that the highest price should be the only consideration in such a bidding process. APN asked attorney John Woodham–a critic of the ADA who has brought litigation many times against the agency–whether he agreed with Andrews’s opinion. Woodham said there are conflicting state law provisions, one of which does seem to restrict cities to sealed bids only. However, Woodham said if that were the case, he does not understand why the Council–at least through some Councilmembers–has been able to shape the draft RFP up until this point. That is, if the Council is not able to do its own RFP because it should not be inserting policy priorities into the sale process, then it is “squirly” logic, Woodham said, that allows them to insert their policy priorities through input and consultation with the ADA up-front. The City also, however, had the option to put the Civic Center up for lease; however, such an option was summarily dismissed with little discussion by the Council. Finally, Archibong noted that there is a way that the redevelopment of Civic Center will come back to the Council that has not been discussed, and that is the likely rezoning that will be necessary to accommodate whatever proposal the ADA selects.